The Bag Boy Company, known for innovative push carts, is thrilled to announce the launch of the Quad XLR Rental Cart this spring 2019. Bag Boy originated in 1946 and continues to revive and modernize their line of products while continuing to lead the market through innovation. 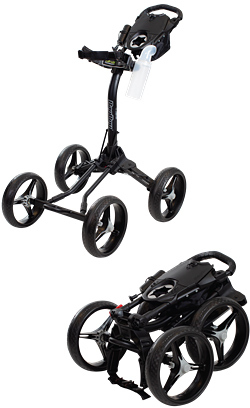 With four large wheels and a sleek, weather-resistant aluminum frame, the newest addition to the Bag Boy line of products offers superior stability, durability, and is super compact for storage. Its anodized finish prevents corrosion in extreme weather conditions. Another quality that makes this cart so desirable is its ability to fold in seconds with its built-in simple two-step fold feature. When folded, its dimensions are 26” x 23” x 15”, so it can easily be stored. The Quad XLR boasts a removable bag bracket for anti-theft and security purposes. It features large G-Force wheels with a steel reinforced brake tab and a foot-controlled parking brake for ultimate handling. The Quad XLR will be available April 25th. Founded in 1946, the Bag Boy Company has built a reputation for unmatched quality, unbelievable durability and unsurpassed innovation and design. Bag Boy designs, manufactures and distributes a full line of award-winning, feature-loaded golf bags, push carts, travel covers and accessories designed for a golfer's on-course convenience and comfort. For more information, please visit www.bagboy.com. Follow us at facebook.com/bagboygolf, twitter.com/BagBoyCompany and linkedin.com/showcase/bag-boy-company. Established in 2004, Dynamic Brands is the parent company for a portfolio of premium brand name companies committed to the development of innovative, high-quality products and supported with outstanding customer service in the sporting goods industry. Golf and recreational products are offered through Bag Boy, Burton, Datrek Golf, Devant Sport Towels, IGOTCHA, Riksha, SEARCH 'N RESCUE and FLAGPOLE-TO-GO brands, and include walking carts, golf bags, travel covers, custom sport towels, bag tags, golf ball retrievers, flags and accessories. Dynamic Brands' products are marketed in 87 countries worldwide. For more information, please visit www.dynamicbrands.com. Follow us at facebook.com/dynamicbrandsrva and linkedin.com/company/dynamic-brands.